Mitsubishi Motors Corp will use Toshiba Corp's lithium-ion batteries in a small electric vehicle for business use which is set to go on sale in the autumn, the Nikkei business daily said on Friday. The carmaker, which worked with GS Yuasa Corp to produce lithium-ion batteries for its i-MiEV electric passenger car, chose the Toshiba battery for the new Minicab MiEV, based on lifespan and cost, the paper said. Neither Mitsubishi Motors nor Toshiba had any immediate comment on the report, though Toshiba had said in July it was developing batteries for the carmaker. Shares in GS Yuasa were down 4 percent at 580 yen in late trade. Mitsubishi Motors President Osamu Masuko had indicated the automaker would likely need a second battery supplier to complement its battery venture with GS Yuasa, saying a Japanese manufacturer would be its preferred choice. Japanese and South Korean battery makers are fighting for share of the nascent market for low and zero-emission vehicles. Mitsubishi Motors aims to offer the Minicab MiEV for less than 2 million yen ($24,450), initially relying on subsidies from the government. Japan has yet to decide whether or how much in subsidies it might earmark for the purchase of electric cars beyond the fiscal year ending in March. Mitsubishi Motors became the first major carmaker to begin selling all-electric cars to individuals last year. 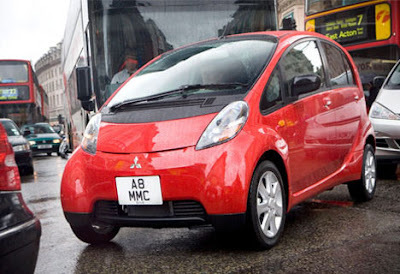 The commercial-use EV is set to have a range of 100 km (62 miles) on a full charge, compared with the i-MiEV's 160 km (100 miles), in a bid to keep costs low.